Evolution, Vogue, auRA. Evora. That’s the etymology of the first new Lotus since 1995, when the delicious Elise came to market. Staying true to the tradition of the Norfolk-based company, Evora designers obviously chose a name that starts with an "E" (as in Elite, Elan, Europa, Esprit, Exige and Eleven, the original E-named Lotus). We recently got a close look at the new Evora at John Scotti, official Lotus retailer in Quebec. Still going against any form of mass production, the ultra-British brand, which is now owned by the Proton Group of Malaysia, stays the course by introducing the heir to the Lotus Esprit, a high-performance GT car built from 1976 to 2000. We recently got a close look at the new Evora at John Scotti, official Lotus retailer in Quebec, alongside Jim Carter, the brand’s regional director for Eastern North America. 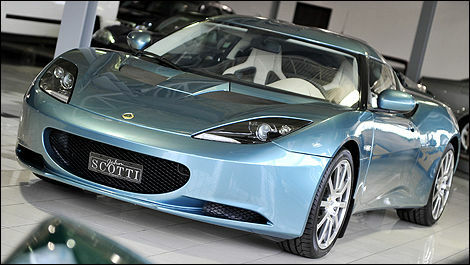 "The Evora will hit the market in the first quarter of 2010," he said. "We plan on delivering a thousand units annually across the continent, including 150 in Canada." Bernard Durand from John Scotti confirmed that 10 pre-orders have already been received. Next to a couple of flashy Elises and Exiges, the Evora is instantly identified as a Lotus, with the same overall looks, curvy silhouette, truncated rear, almond-shaped headlights, wide stance and smiling mesh grille as the rest of the family. Okay, the DNA is identical, but the car is actually a few centimetres larger in every dimension so as to offer more interior room than the Elise (the Evora is a 2+2) and accommodate the Toyota-sourced 3.5-litre V6 right behind the passenger quarters. 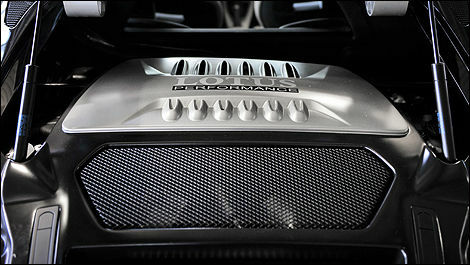 Said V6 is an all-aluminum, DOHC unit with variable valve timing which teams up with a 6-speed manual gearbox. In this application, output is rated at 276 horsepower at 6,400 rpm, allowing 0-100 accelerations in 5.1 seconds, or so claims the automaker (the top rival of the Evora, the Porsche Cayman S, takes 5.4 seconds). We’ll have to wait and see for ourselves because the Evora and Cayman S roughly boast the same weight (1,350 kg), with the latter producing 20 additional horsepower. In this application, output is rated at 276 horsepower at 6,400 rpm. In fact, the Evora’s weight took us by surprise. Of course, 1,350 kilos isn’t very much by sports coupe standards, but it could have been significantly lower when you consider that the Elise weighs only 900 kilos. The Evora is also built on a remarkable chassis that uses the company’s innovative ‘bonded and riveted’ technology, not to mention aluminum suspension components and fiberglass body panels. Come to think of it, how can the Evora not weigh any less than the Cayman S, which does not rely on that much lightweight material? The Evora is also built on a chassis that uses the company’s innovative ‘bonded and riveted’ technology. Let’s step inside where comfortable Recaro buckets meet with a wraparound dashboard and a small leather-trimmed three-spoke steering wheel. 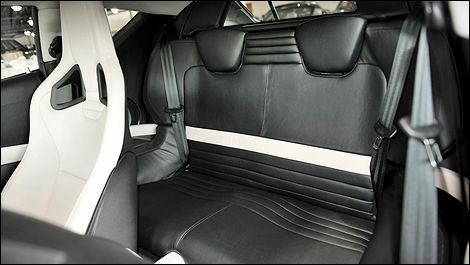 The middle section houses an Alpine multimedia system with touch-screen display, navigation, DVD playback, Bluetooth connectivity and audio input. Climate control as well as power mirrors, windows and door locks all come standard. So do the electric power steering and tire pressure monitoring system (no spare tire). Unlike the barebone Elise, whose beautiful aluminum chassis pokes through the skin, the Evora is more buttoned-down and carefully hides its metallic parts. You can even call it a "wagon" if you like due to the small bench seat in the back that can accommodate two children or babies (there are LATCH points). Now that’s something that will set the Evora apart from its German rival! Two questions remain. First, what will the price be? "About the same as the Cayman S," claims Lotus. And how does it handle on the road? Well, stay tuned for our comprehensive review coming next spring. You can even call it a "wagon" if you like due to the small bench seat in the back.